I've just finished listening to Fall of Man for the fifth time and I must admit I'm exhausted. There are so many things I don't understand about this CD. It seems to me that every anthology these days has to have a theme, a theme with a catchy title, which is usually in two parts and separated by a colon. There is really nothing wrong with this. The real problem is that as often as not these titles and purported themes do nothing to illustrate what is actually contained on the CD, which makes them window dressing. I don't mean to quibble over details, and I suppose titles are details, but as I said, I'm a little exhausted. 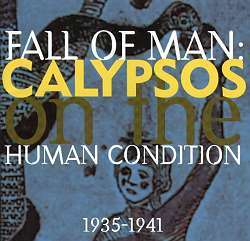 Let me just say that this particular CD could have just as easily been called 'Calypsos 1935-1941' as 'Fall of Man: Calypsos on the Human Condition'. After all, what really connects this amalgam of pieces is that they are calypsos from a period of great international popularity for the genre, the 1930s. "The human condition is a popular component in Trinidad calypsos. Philosophy, superstition, life, death, money, status, and male female relations all receive attention in their lyrics." This quote is directly taken off the back cover of Fall of Man and seems to illustrate my point about themes. Philosophy, life, death, money, male-female relations ... it seems to me that almost any calypso, or any song for that matter, could fall under this large umbrella called the human condition. I'm left wondering: what were the editors' criteria for deciding which calypsos fell under this umbrella, and how do we decide which calypsos, if any, might not be included? At least half of the calypsos are about the last category mentioned in the quote, male-female relations. Is this meant to suggest that female-male relations are closer to the heart of the human condition than life, death, and money? Or were there just more calypsos available to the collectors that dealt with this particular theme? Anyway, I am going to tell you right now, if you buy this CD, you are getting a collection of calypsos from 1935-1941 by many of the famous calypsonians of the period. If you want to think about how much each calypso relates or does not relate to the human condition, be my guest. The cover of the booklet that accompanies the CD shows a nice picture of Eve taking the apple from the serpent while Adam stands by watching, illustrating the 'Fall of Man' part of the title. After all my ranting and raving, I will admit this; there are a number of selections in the CD that do work around this theme. The title track, performed by The Lion, is an obvious one, but a number of others in the collection tell stories of women who fool or cause the ruin of their men. This, of course, is not a theme unique to calypsos. It seems to me that much of male dominated traditional music is about women and the bad deeds they've done men, though the opposite is probably closer to the truth in most traditional cultures. While I can often find something humorous, clever, or moving in many of these male songs about women (maybe because I am a man), I have to admit I found some of the selections on this CD a bit wearying, less than funny or clever, and perhaps a bit too misogynistic, but maybe I am being too serious. Inside the booklet is an essay by John H Cowley and transcriptions of each of the calypsos in the collection. While I appreciated the transcriptions, the essay typified the sort of thing that frustrated me about the CD. For example, the third paragraph begins "all the singers here are male," and then launches into a discussion on some of the female calypsonians of the period that are not included. Why? The editor admits to a male bias in the contents of the CD so I suppose the discussion of the female calypsonians hopes to make up for the lack of their presence. In my opinion, if Mr Cowley wanted to write about female calypsonians in Trinidad as part of his liner notes, he should have made sure some were included on the CD. Brief explanations of many of the calypsos found on the collection make up the major part of Mr Cowley's essay. Sadly, the explanations are not very insightful or informative. To be fair, they are similar to the types of explanations reviewers (at least myself) might give of many of the calypsos. The difference is that as a reviewer, I am assuming that the reader can't hear the songs, so any explanation I am able to give might be informative, while Mr Cowley must be aware that the readers of his essay have already purchased the CD and can therefore hear the calypsos and read the lyrics for themselves. But enough, let's move on to the music. The CD starts off well enough, with Sadu Man from Neville Marcano, AKA the Tiger. This is one of those calypsos about male female relations. It describes a man who takes on the life of an ascetic, a sadu, after finding his girl with another man. It is charming, in part because of Marcano's delivery, which suggests both humor and sensitivity. While the calypsonian certainly disapproves of his woman's behavior, he manages to poke fun at himself along the way. Women will rule the world. The rest of the calypso continues in much the same vein. While this could possibly be viewed as a comment on gender relations in an evolving labor market, I found I just couldn't appreciate its wit or its overall message. Maybe I was overly bothered by what I felt was its "scapegoating" of women. Still, I'd be interested to hear what women think of the song. As I mentioned earlier, I may just be a little too serious. While Atilla the Hun performs two of the worst calypsos on the CD, he is also involved in a number of the better ones, including Women are Good and Women are Bad, Friends, and Martiniquen. Women are Good and Women are Bad, featuring Atilla and Lord Beginner, is an example of comparative dialogue in calypso. It offers a more balanced, and undoubtedly truer, picture of male female relations than either Vagaries of Women or Women Will Rule the World. Lord Beginner begins with many of the same complaints about women that Atilla makes in Vagaries of Women, but this time Atilla responds in defense of women. Is that they are mankind's consolation. Maybe not feminist by today's standards, but an improvement nonetheless. In Friends and Martiniquen the orchestra really gets jumping and Atilla's terse vocal delivery helps to provide some extra energy, all of which reminds me to mention one of the less obvious aspects of this CD, the music. The orchestras which accompany the calypsonians on this CD provide wonderful examples of the early jazz tradition in Trinidad. Calypso and jazz were developing side by side in the early part of the century, and throughout the CD you can hear how American jazz bands must have influenced Trinidad orchestras. Some of the calypsos have a clear New Orleans jazz influence, while others show the influence of swing jazz. All in all, aficionados of early jazz might appreciate this CD as much aslovers of Trinidad calypso. Four of the best calypsos in the collection come a little more than halfway into the CD. Exploiting, Monkey, Calypso Behind the Wall, and Not Me with Matrimony all share the call and response vocal style that is so common in African-American musical forms. The call and response form probably came to calypso via the calinda, or stick fighting song, one of calypso's many roots. The changing of a single word, explorer to exploiter, gives a profound sense of depth to this calypso. It raises it above the simple 'status' calypso to one that belongs to another great tradition in the genre - that of political commentary. Much of Exploiting is boastful, with the calypsonian painting himself as a fearless explorer in the mold of Sir Francis Drake and Vasco da Gama, but there is also a plaintive quality, a sense of regret and even a condemnation of what this "exploring" or "exploiting" has meant for those explored or colonized and those who, like the family of the calypsonian, were taken from their homes and sent to far away lands against their will. This type of subtle commentary, combined with the usual calypsonian bravado, is an example of what can make calypso so great. Listeners may recognize the melody of Calypso Behind the Wall as Jump in the Line, a calypso popularized by Harry Belafonte in the USA. The melody is essentially the same, although the lyrics are different, the lyrics to Calypso Behind the Wall being more substantive. Monkey is unique in its use of three vocalists, each seamlessly adding lines to a catchy chorus. Not Me with Matrimony is another by Atilla the Hun in which he humorously explains the downsides of marriage. Don't Hide Him Behind the Door (track 22) is another good calypso with call and response vocals, but I am usually too tired by the time it rolls around to really give it a good listen. To tell you the truth, I usually tune out around track 18. I guess this is where I have to admit I have a saturation point with the Trinidad calypso of the 1930s. After a while, my concentration leaves me and the songs begin to all sound the same. If you don't have any such saturation point then maybe this is the CD for you. After all, the more the better, right?